Education Minister Naftali Bennett strongly criticized Prime Minister Binyamin Netanyahu and Interior Minister Aryeh Deri's deal with the United Nations High Commissioner for Refugees (UNCHR) to deport approximately 16,000 illegal infiltrators while allowing the rest to remain in Israel. 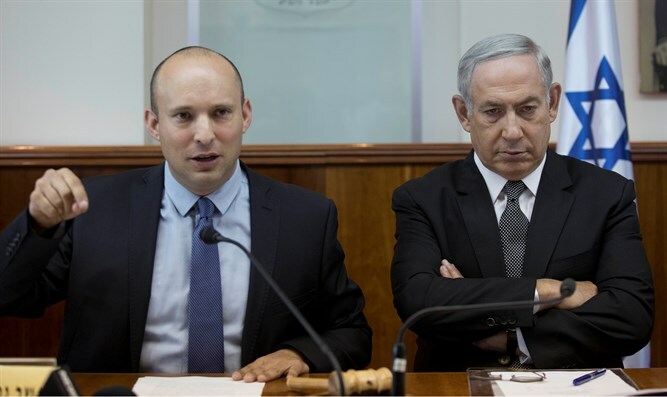 "The agreement to grant status to 16,250 infiltrators in Israel will turn Israel into a paradise for infiltrators and constitutes a total surrender to the false campaign that has been disseminated in the media in recent months," said Bennett. He added that "the original plan formulated by the government regarding the infiltrators is moral and just, and must be acted upon only by saying that refugees from places of danger will be absorbed in Israel, while infiltrators will be returned." The minister clarified that in the new outline, Israel will absorb migrant workers who have not submitted asylum applications. "By signing this agreement, we are sending a dangerous message to the whole world: Anyone who succeeds in infiltrating Israel illegally receives a residency award here or in a Western country, and this is a call for millions of potential migrant workers to come to Israel. The credibility of the Israeli government is at stake, alongside our moral obligation to the residents of southern Tel Aviv, who live as a 'state within a state,'" Bennett said. He called on the prime minister to bring the agreement with the United Nations to the cabinet for approval at its next meeting, immediately after the Passover holiday. Prime Minister Netanyahu explained why the government reached the agreement with the UN at a press conference Monday afternoon. "From the moment we understood that the solution of [sending the infiltrators to] a third country was not on the table, and that the situation was such that everyone would remain, we found ourselves in a trap," Netanyahu explained. He said that the 16,250 infiltrators who will be deported will be taken in by Canada, Germany, and Italy under the "unprecedented agreement."